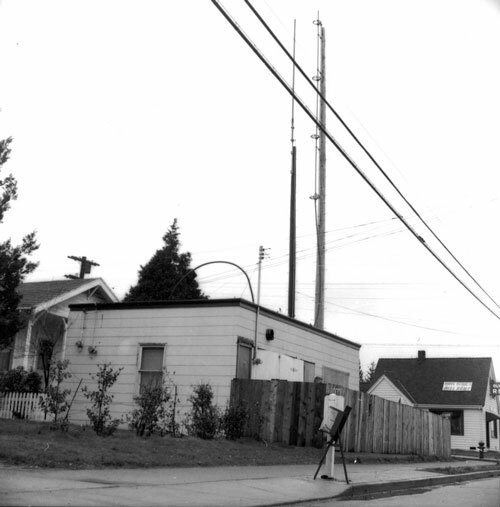 This was KRAB's first location, circa 1962, on the top of Roosevelt Hill, before the fence got a paint job. There were two doors, the near one in South-East corner by the power meter leads to the control room, transmitter room, and thence to the studio/office. The other entry is in the middle of the East side, and goes directly into the "main" (actually, only) studio and business office. KRAB antenna is mounted on the "power" pole on the center-right of the photograph. Further to the right, across 91st and behind the fire hydrant, is KRAB's land lord, Olympic View Realty, 9101 Roosevelt Way NE, (Clarence P Schwartz, realtor - "Have Homes Will Rent"), to whom was paid the monthly rent. Lorenzo Milam reading a record jacket. 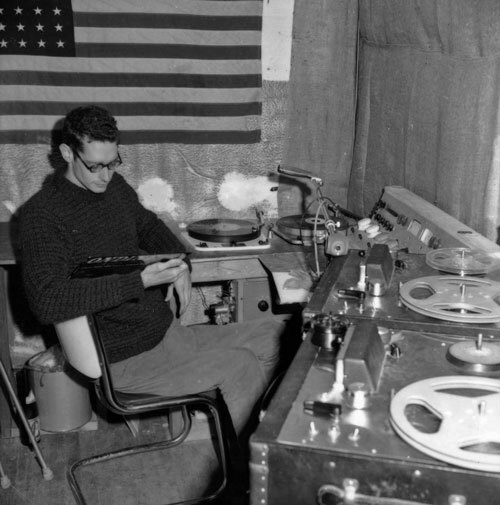 Early configuration of the control room: turn tables against the West wall, board in the corner and tape decks (still in their fiberboard cases) on the North wall. 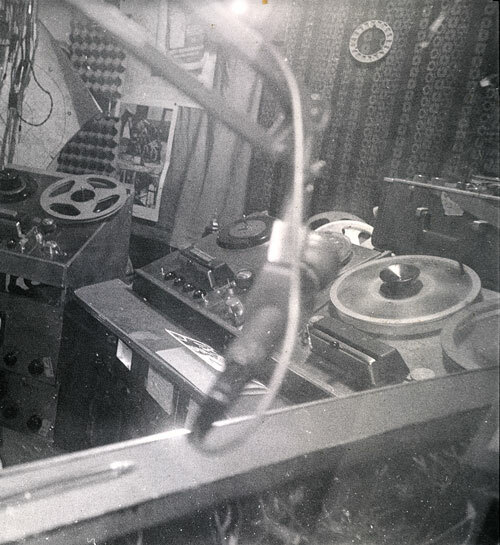 A little later another configuration, seen through the doorway: tape decks moved to West wall, turntables moved to East and theoretically protected by plywood shield, the board is invisible on the right under the window that faces the transmitter room and studio/office. Photograph shot from transmitter room, through glass, over the board. 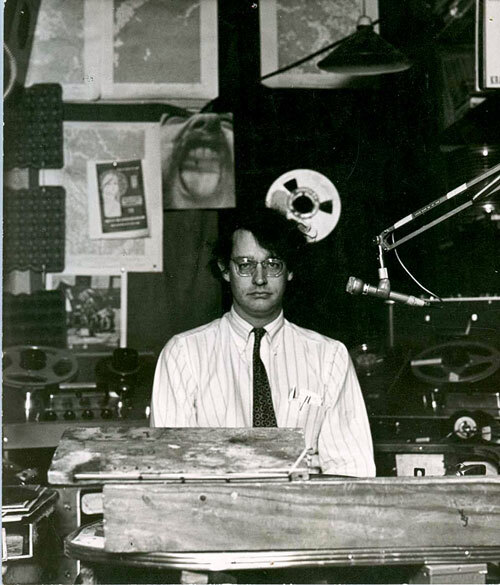 Tape decks on west wall. Through The Board passed the music, the message, and, should there happen to be any, the meaning. As I remember we had a program channel, a record channel, and a cue "channel", and, eventually, a patch panel below. The white rectangle upper left is a clip board with program and engineering logs. 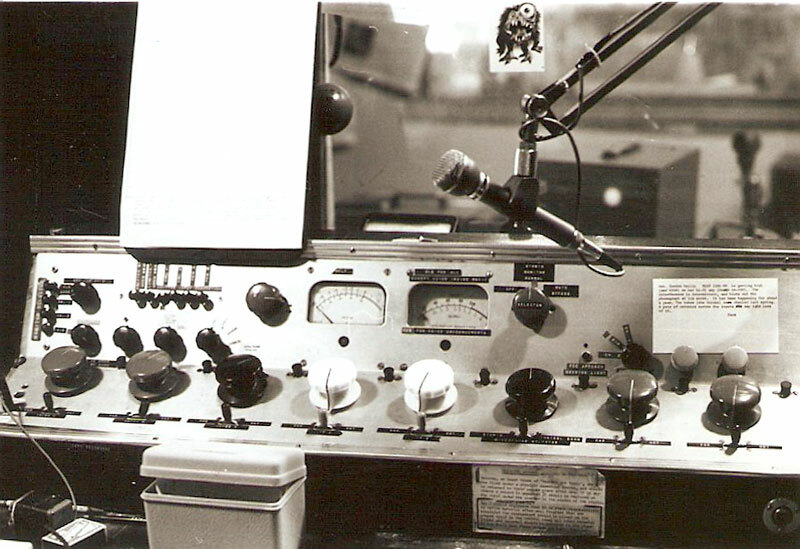 The double-paned window behind the microphone looks into the transmitter room and then through another double-paned window into the multi-purpose studio, library, and business office. Photo courtesy David Rowland. 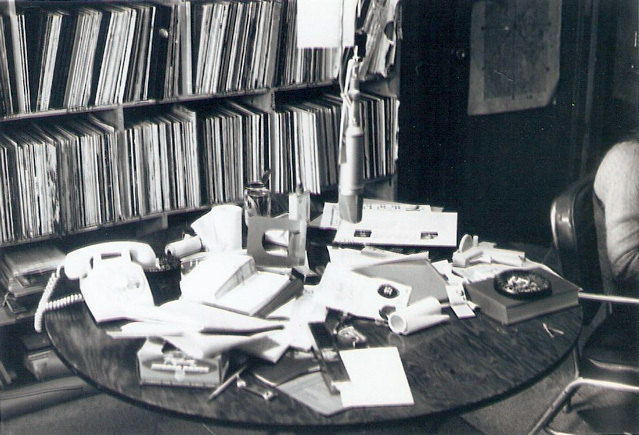 The largest room in the doughnut shop served as the recording studio, record and tape library, and business office (the desk and file cabinet, both usually covered with papers, and typewriter are out of sight on the right). This photo was shot for a fancy fund raising brochure. Notice the prominent product placement given Margason's coke. Interviews, panel discussions, radio drama, poetry, and occasional musical performances were all crowded into this room. Ali Akbar Khan and Chatur Lal were interviewed here after a concert at UW Health Sciences. 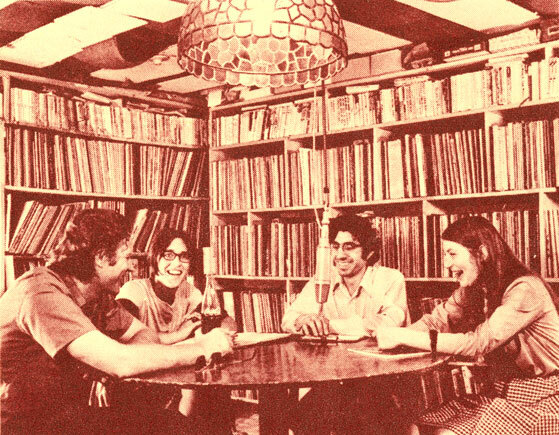 Left to right are Gary Margason, Nancy Keith, Steve Menasian, and Mary Siegel. "...like the time we got Natalie to paint "KRAB" on our fence for us; she said, 'How shall I do this?' and we said, 'Hell, anything; something to stop people from barging in on KISW down the street looking for a panel on Adultery.' She said, 'I'll paint it so it looks like a dirty word some kid scrawled on the fence.' We thought that was fine but it didn't matter anyway because if it looks like a dirty word, it was done by a Baroque child."